Disclosure: Chicken Soup for the Soul: Home Sweet Home book was provided for me in order to facilitate my review. All opinions are my own and honest. I am disclosing this in accordance to FTC Guidelines. Please see “Disclose” tab for more information. I absolutely love summer and even more than that I love to read. Being as I have summers off, I love to spend time reading and playing with my girls. The majority of their nap times you can find me curled up with a great book. My new Chicken Soup for the Soul book: Home Sweet Home did not disappoint. Chicken Soup for the Soul has been publishing the famous Chicken Soup for the Soul series of books for over 20 years. These books have allowed people just like you to share extraordinary stories that can chance someone’s life, or even the world. In addition to offering books, they also have decided to offer a new line of comfort foods that are as nurturing as our books. They also make wholesome and balanced food for dogs and cats. Home is where the heart is. Whether your home is an apartment, a house, or a condo – rented or owned – the 101 stories in this book, all about the place you call home, will warm your heart. You will find joy, laughter, and inspiration in this collection of stories about cooking, family meals, decorating, remodeling, repairing… everything we do to make a home. What an awesome book! I have been incredibly excited about reading this book. Having a home and family of my own makes reading about other’s so much more exciting. This book is exceptional and can’t wait for one of our wonderful readers to get a copy of their own. If you are interested in purchasing a copy for yourself, head on over to amazon and order your copy. 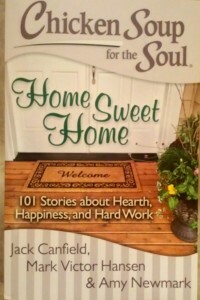 1 Lucky winner will win a copy of Chicken Soup for the Soul: Home Sweet Home. This giveaway is open to U.S. Residents only. Ends August 10th. I would like Chicken Soup for the Soul: The Dating Game. I like The Magic Of Mothers & Daughter Book. Thanks for the giveaway! I think the Say Hello to a Better Body would be a good one. I am not in my 50’s yet. It just feels like it some days. 🙂 Thanks for the chance! I like the parenthood book! Thanks for the great giveaway! I would like to Read Chicken Soup for the Soul parenthood. It looks like it would be a good one. I like The Magic Of Mothers & Daughter Book. I have such a special relationship with my Daughter. Thanks for the giveaway! I am excited. I hope I win the prize. Happily Ever After book. Thanks for the giveaway! I am excited. I hope I win the prize. I would like to have the book, Billy Graham and Me. The Sesame-Ginger Meal Builders Cooking Sauce is one of the food products I would like to try. Thanks for the giveaway!